The religiosity among Dutch people of Turkish and Moroccan origin has increased in recent years. They pray more often, the women wear headscarves more often, and the mosque is visited more often. This is shown by research from the Social and Cultural Planning Office (SCP). According to the survey, 78 percent of Moroccan Muslims pray five times a day, compared to 33 percent of Turkish Muslims. 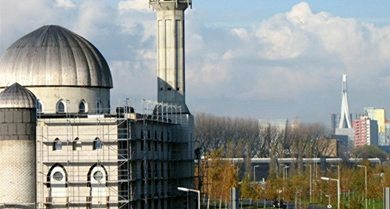 Visits to mosques have increased among Turkish Muslims. About 40 percent of both groups visit a mosque at least once a week. Moroccan Muslim women increasingly wear a headscarf. More than three-quarters of them (78 percent) say they wear one, compared to 64 percent ten years ago. There is also an increase among young people and the second generation. This increase does not exist for Turkish Muslim women. Seven of the eight Moroccan Muslims fast every day during Ramadan. Among Turkish Muslims, that applies to just over half. A very large proportion of Muslims almost always eat halal. Among Turkish Dutch people, the non-religious portion has slightly increases during the period 2006-2015, but not among Moroccan Dutch. The proportion of Muslims has decreased among Turkish Dutch (from 93 to 86 percent), but not among Moroccan Dutch. Of them, 94 out of 100 consider themselves Muslim. The more highly-educated and second-generation Turkish Dutch are especially relatively non-Muslim. On the basis of their religious behavior, opinions and identification, five groups of Muslims may be distinguished. The two most religious groups, the pious and strictly practicing Muslims, make up 84 percent of Moroccan Muslims. Among Turkish Muslims this is less than half (45 percent). There are few secular Muslims (7 percent among Turks and 2 percent among Moroccans). This entry was posted in Counterjihad, Enrichment, Europe, News, PC/MC, Religion, Sharia by Baron Bodissey. Bookmark the permalink. Interesting. The report does not mention Indonesia? Indonesia was a Dutch colony, and until now the country with highest muslim population. Indonesia muslims is not in the top 3 of religious muslim in Dutch is amazing. No Bret it is not. The islamization of Indonesia only took of at a rapid pace after the de-colonization in the post-war years. The Indonesians during the colony years were mostly christian pagan or atheist as are their descendants now living in Holland. Very few Indonesian muslims indeed. Indeed, the “Indonesians” that emigrated to the Netherlands were the ones *running away* from the muslims. These were mostly eurasians and people of chinese descent. The “Molukkers” are a separate group of christian indonesians from the Maluku islands, loyalist soldiers whose situation became impossible after the dutch were thrown out. During the bersiap period, about 10,000 dutch civilians were tortured, raped and murdered, many by muslim criminal groups Hizbullah en Sabillilah. These findings kind of beg the question of whether the intensity of Turkish or Moroccan Muslim observance is related to measures like assimilation, criminality, productivity, national identification and the like. There’s nothing like real data to dispel the accusation of bias and prejudice. What the public-relations experts of Muslim organizations claim is that Muslims can integrate into society the same as non-Muslims, and that the violent exceptions are statistical outliers of no importance. So, let’s subject that to an analysis, hopefully with the support of Muslim organizations, who will be anxious to let the truth be known about the actual assimilation of their coreligionists. I sound a bit sardonic here, but when you’re dealing with factual arguments, sometimes a neutral approach will give you better data and a stronger argument. Sadly, a significant proportion of the population, including elected leaders and powerful bureaucrats, have little or no interest in actual facts. But, that should not change the approach of people who actually know better. That’s so. Though the purpose is not to be better people, more just and fair, meeker or friendlier, kinder or gentler, more educated and polite, suave or courteous. . .
That means they become prouder, more arrogant, more self-important, more hostile to kaffirs, more disciplined : not in the way of getting themselves of filth, but in the way of controlling and commanding kaffirs. That all has only one goal: to usurp infidels’ lands and women as they have done for the last 14.0 centuries. And the kaffirs are too happy with that. Strange but true. Oh Traitors it is your fault not the jihads’. Of course they are recommitting to their beliefs. They are well-aware they are an invading force operating under the doctrine of hijra. As such an organization in such a situation they would be foolish NOT to improve their standards and internal discipline against the infidel.